NMR Spectroscopy Laboratory of the Jagiellonian Center of Innovation has an Avance III HD 400 MHz (Bruker) spectrometer equipped with gradient probes working in a mode of normal (BBO) and reverse (BBI) detection. Both probes allow for measurement of H spectra and spectra of other nuclei (wide-spectrum probes). Identification of chemical substances with determination of chemical structure, often also of spatial structure and purity of compounds. Note! For our regular clients, the results can be provided via FTP. * If the sample is submitted to JCI on Friday after 12:00 noon, the result will be ready on Monday before 12:00. Holder of PhD in pharmaceutics with an extensive experience in NMR spectroscopy research. 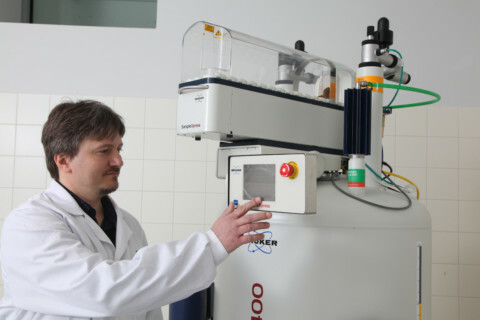 He obtained his PhD at the Faculty of Pharmacy of the Jagiellonian University Medical College, where he worked from 1997, and beginning from 2007 he was the head of NMR Spectroscopy Laboratory of the Faculty of Pharmacy of the Jagiellonian University Medical College. In his scientific work, he was involved in application of NMR spectroscopy in structural analysis of organic compounds. A co-author of more than 20 scientific papers. He has been working in the Jagiellonian Center of Innovation since 2013 as the head of the NMR Laboratory responsible for performing NMR analyses and solving structural problems.